Charles M. Russell National Wildlife Refuge (CMR) encompasses about 1.1 million acres (including Fort Peck Reservoir on the Missouri River) in northeastern Montana. To ensure that sufficient streamflow remains in the tributary streams to maintain the riparian corridors, the U.S. Fish and Wildlife Service is negotiating water-rights issues with the Reserved Water Rights Compact Commission of Montana. The U.S. Geological Survey, in cooperation with the U.S. Fish and Wildlife Service, conducted a study to gage, for a short period, selected streams that cross CMR, and analyze data to estimate long-term streamflow characteristics for CMR. The long-term streamflow characteristics of primary interest include the monthly and annual 90-, 80-, 50-, and 20-percent exceedance streamflows and mean streamflows (Q.90, Q.80, Q.50, Q.20, and QM, respectively), and the 1.5-, 2-, and 2.33- year peak flows (PK1.5, PK2, and PK2.33, respectively). The Regional Adjustment Relationship (RAR) was investigated for estimating the monthly and annual Q.90, Q.80, Q.50, Q.20, and QM, and the PK1.5, PK2, and PK2.33 for the short-term CMR gaging stations (hereinafter referred to as CMR stations). The RAR was determined to provide acceptable results for estimating the long-term Q.90, Q.80, Q.50, Q.20, and QM on a monthly basis for the months of March through June, and also on an annual basis. For the months of September through January, the RAR regression equations did not provide acceptable results for any long-term streamflow characteristic. For the month of February, the RAR regression equations provided acceptable results for the long-term Q.50 and QM, but poor results for the long-term Q.90, Q.80, and Q.20. For the months of July and August, the RAR provided acceptable results for the long-term Q.50, Q.20, and QM, but poor results for the long-term Q.90 and Q.80. Estimation coefficients were developed for estimating the long-term streamflow characteristics for which the RAR did not provide acceptable results. The RAR also was determined to provide acceptable results for estimating the PK1.5., PK2, and PK2.33 for the three CMR stations that lacked suitable peak-flow records. Methods for estimating streamflow characteristics at ungaged sites also were derived. Regression analyses that relate individual streamflow characteristics to various basin and climatic characteristics for gaging stations were performed to develop regression equations to estimate streamflow characteristics at ungaged sites. Final equations for the annual Q.50, Q.20, and QM are reported. Acceptable equations also were developed for estimating QM for the months of February, March, April, June, and July, and Q.50, Q.20, and QM on an annual basis. However, equations for QM for the months of February, March, April, June, and July were determined to be less consistent and reliable than the use of estimation coefficients applied to the regression equation results for the annual QM. Acceptable regression equations also were developed for the PK1.5, PK2, and PK2.33. 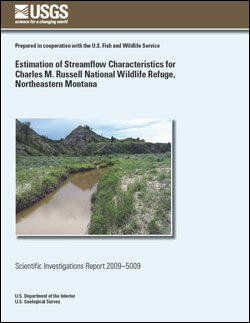 Sando, S.K., Morgan, T.J., Dutton, D.M., and McCarthy, P.M., 2009, Estimation of streamflow characteristics for Charles M. Russell National Wildlife Refuge, northeastern Montana: U.S. Geological Survey Scientific Investigations Report 2009–5009, 60 p.